Big hop flavours complement this rich dark ale in this ultimate example of fusion between some of our favorite styles of beer! 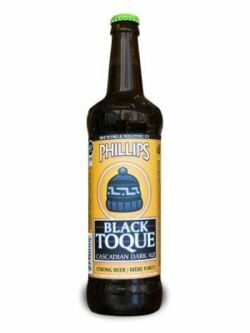 Formerly known as Skookum Cascadian Dark. 650ml bottle. Roasted coffee and dark chocolate aroma. Very dark brown, almost black porter-like appearance. Roasted malts and espresso coffee flavour with some bitter hop notes. Medium body. Mostly bitter finish. Pretty good. Aroma of chocolate, toasted malt, coconut, and grains. Taste is primarily toasted malt. Visual: Pours cola dark brown with a decent creamy dissipating head, a 1mm layer of retention with sticky lacing, clusters of fast streams. Nose: sweet bread, toasted-light roasted malt. (lvl-6)-pungency Attack: slick-crisp, half creamy-tingly Mid-palate: (lvl-4)-sweetness, (MAIN) dry piney & citrus tangy bitter hops, brown sugar, roasted barley malt Finish: lingering sharp hoppy bitterness, roasted woody malt exhale, resiny finish. Summary: A very drinkable balance of smooth entry, sharp bitter, and roasted malts. Good texture throughout. Single 341 ml bottle from Liquor Depot, served in a straight-sided goblet. Considering how beat-up the edges of the bottle appear, it might have been orphaned a while. I love the very craft-esque label, with hand-drawn art on not-glossy paper and definitions for the word "skookum" down the side. Pours a deep cola caramel with a huge tan head, leaving generous lacing. Aroma initially consists of herbal hops, like pasta sauce cooking spices, and something mushroom-like and earthy over a current of rye toast and faint sweet caramel. The flavor flips things around, and is mostly deep-roasted malts, cocoa nibs, and coffee beans, initially distractingly bitter, but then settling back to being just roasty, and with a hint of caramel, with the herbal hops lurking behind. Slightly thick, with a short bitter finish. A strange aroma profile, but a good imperial stout-like flavor. Definitely "skookum". Not a bad Cascadian Brown Ale - nice bitter burst of citrus hops, but unfortunately something tasted off balance in the malts - almost a sharp metallic taste which was disjointed from the rest of the beer. Bottle. Dark brown pour with a ruby hue and frothy tan head. This tastes like a sessionable version of Puzzler; a little lighter, less roasty and less hoppy, but still that slight roasty bitterness with a balanced hoppy bite. Not bad. Palate is a touch watery, but still flavourful. 355ml bottle. Hadn’t had this in a long time and (as seems to happen) I didn’t love it quite as much this time around. Smoky burnt malt, molasses, cocoa, coffee, tin can, blend of west coast hops. Full-bodied, slick and earthy with great bitterness. Bottle. Pours a dark brown, white head that dies down fast and leaves a wall of lace. Nose is fresh and nutty, touch of hops. Tastes malty like a stout, hop bitter, a little chalky on the mouthfeel.